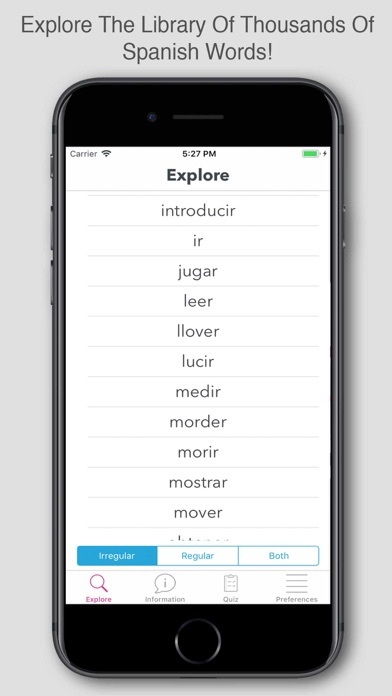 This app best for learning Spanish verb conjugations. There is a quiz mode with three difficulty levels. It has descriptions of all the tenses with example uses. Learn the translation and pronunciation of words in Spanish with the Spanish-English Dictionary. It's perfect for students! FEATURES: · Audio pronunciation of each word using text to speech technology · Irregular and regular Spanish verbs in all Spanish verb tenses. · Quizzes are available. · Spanish-English and English-Spanish dictionary · Lots of examples!